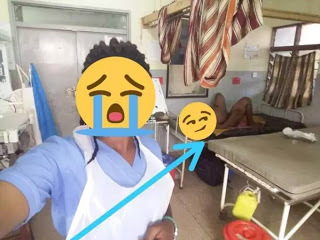 An unidentified nurse of a general hospital has been under attack, verbally, by social media users for posting a selfie which also revealed at the background a nak3d pregnant woman who was laying down on a bed. The controversial photo which has been making the rounds on social media for obvious reason, sparked outrage among netizens. They felt it’s disrespectful for the patient and unethical for the health personnel to have taken the picture with the nak3d pregnant lady in the background.